Supported through the efforts of A Bibliophile’s Workshop-editorial/publicity services for self-published writers- the first inaugural Blog Tour is here. For this first blog tour, Indulge your mind with some lovely yarns of poetry, perfect as an antidote to life’s trials and tribulations!! Celebrating the Poetic Legacy of Thelma Barselow, one poem at a time…. Like & Share these posts with a wide pool of people, to be eligible to win a special literary prize…. more details about such a prize can be found below! 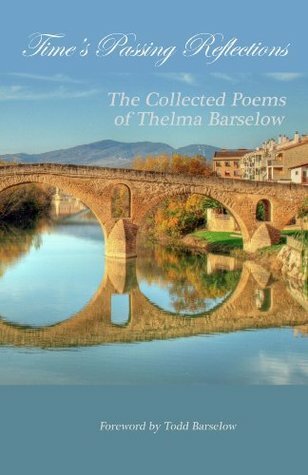 Capturing the vivid intimacy of journaling combined with the photographic realism of rich poetry, Thelma Barselow’s collection of poetry is a volume of poetry that any serious reader of poetry will not want to miss!! “This collection of poetry spans the years and encompasses a lifetime of observations, broken down into simple, yet elegant and sometimes whimsical poems. Some of the poems are religious, others are merely soulful. Thelma has spent her life caring for others, starting with her children and her husband. That career included caring for the children of others, and ultimately, taking care of Alzheimer’s patients which she did until her recent retirement. Today is the last day of the blog tour for Thelma’s Barselow’s Time’s Passing Reflections, and I thank Todd Barselow for, again, granting permission for his mother’s poetry book to be featured on this blog tour. I’m ending this blog tour with a review, written by one of my blog’s numerous contributors (all with their own distinctive writing style), and Paula offers a very thoughtful, critical review, which reflects the fact that Time’s Passing Reflections is a work worthy of serious reading. Many people will come away with a gamut of different feelings, in response to a work of poetry, and it’s A Bibliophile’s Reverie’s goal to always celebrate freedom of thought, expression when it comes to reviews being featured, even for blog tours. Reviewing poetry can be very much like wandering through a thorn forest. Like much Art with a capital “A”, poetry comes in many shapes and forms, with varying levels of artistic achievement. The wonderful thing about poetry is that even those verses that are not high art can still find an audience that will appreciate and cherish them. This is what makes reviewing it so difficult and dangerous, because when readers love a particular work, any criticism sounds to them like an attack and they then gird themselves for bloody battle. I anticipate that kind of reaction to this review, because I have to analyze Barselow’s work on several levels, and the results are not always favorable. First, it is necessary to determine how to categorize Barselow’s poems. Generally, we look to form, style, tone, philosophy, school and subject matter. At a certain level of accomplishment, a poet will attempt to use language to reach an emotion, a description, or a narrative that is enhanced by the use of poetic conventions. It is the same as an artist who knows how to create depth, dimension, and light with a particular brush stroke or tint. The poet’s work follows the elemental categories, giving the reader structure. Unlike prose, poetry deviates from a simple straightforward recitation of facts. It relies on imagery, assonance, and a rhythm all in conjunction with subject matter, presenting a lyrical puzzle that gives the reader a sense of fulfillment when they experience the poem. Barselow’s poetry does not easily fit into a serious art category. If you try to classify it, you will find that it is much more a freewheeling form, something that appears to burst from Barselow’s pen without any real connection to poetic conventions. Her themes are almost epistolary, addressing the reader intimately, and asking them to listen to her thoughts, but they do not take the general form of an epistle. Her philosophical approach is primarily romantic religious, which gives credence to that apostrophe style of address…”Dear reader,” whether to God or her fellow Man. The form of the poems is free verse, with a leaning towards the regional, bucolic, or pastoral. Her language is primarily vernacular, reminiscent of regional poets like Frost, but where he attempts to rise above regional unity and reaches towards universalism, Barselow becomes sometimes mired in her location. There are some nice moments when Barselow transcends the everyday and takes it to a greater mystical level, but most stop flat on the obvious plane and leaves the reader with nothing more than a mundane musing. In “My Summer Place of Dreams” this inability to rise above the refrain of a pop song is painfully evident. The descriptions are clichéd. There is nothing new or emotional about describing summer dreaming as when “days are hot, long, and steaming.” In fact it sounds suspiciously like a 1969 summer beach song, and everyone has heard it before repeated with each new year. Similarly “…bright golden days with nothing to do.” Gives the reader nothing surprising, nothing deeper than the surface words. It may trigger memories of similar summers, but not in any new fresh way. It is not the poem that is causing the emotional response, it is the reader filling in the picture with what they are pulling from themselves. That is a pleasant way to pass the time, but it is not the art of poetry; it is only in the form of a poem. Poems that are works of art avoid trite, stereotyped expressions, or ideas that have no originality or freshness. Surf roaring, days with nothing to do, pulling out memories, all are stock phrases. Poetry is meant to excite your imagination and engage a creative process of thought. You can’t do that if the images in the poem are mere repetitions of what we have heard many, many times before you. This is further complicated in this poem by the self-conscious “poetic” language. “To see in the distance a horizon as fair.” follows no conversational form in modern usage. “To dream of distant lands and what lay there.” is a fragment, and a particularly unmusical one in its repetition of distant so soon after distance. The construction “and what lay there” is another clumsy forced poetic form. Her feeling for meter is flawed, with extra syllables disrupting the flow of the poem, causing it to stumble in “I always come back to” and “I’ll always call home.” The number of feet in the last eleven lines is particularly erratic, almost as if she did not read it out loud before deciding it was completed. “Mr. Thom and Buttercup” is one of the worst offenders. It is as if the poet so wanted to fit her story into a certain meter that she reversed sentence order, added interjections like “believe you me” simply as padding, and ended the poem with a dissonant conversational statement from the cat in a poor attempt to echo Old Possum and Eliot. “It Ain’t Southern” is shallow, little more than a joke punchline. Again, Barselow interjects filler like “you see!” simply to pad out a line. It offers nothing deeper than a comical view of regional speech choices. Barselow’s poetry cannot be judged as high art. It is too lacking in editing and polishing to be the level of work that makes it worth serious analysis. The rest of the poems in the chapbook suffer from the same flaws as the ones I have mentioned, and since this is their final form, no benefit would come from dissecting them line by line, rhyme by rhyme, or cliché by cliché. This does not mean it is not poetry and that people cannot enjoy it. Her poetry is more appropriately classified as doggerel rather than lyrical. This is not meant as an insult to Barselow or to those who like her work. The term doggerel simply means unsophisticated, basic poetry, often created on a whim or without great consideration. It means the poet did not sit down and struggle to decide if their form should be aubade or villanelle or cinquain, if their school will be realism, imagism, or New Formalism. Poetry, to quote Wordsworth, is the spontaneous overflow of powerful feelings: it takes its origin from emotion remembered in tranquility. There is no denying the feeling and emotion in Barselow’s poems. Her poetry amuses many, and touches chords with some of her readers, who identify with her musings. I particularly enjoyed the wry humor in her poem “The Secretary.” It was short, but pithy, with a nice twist to the narrative, and a strong image formed by the everyday terms of filing and rejection. It is one of her best pieces, and if all had this sharp polish, you would have to admire her skill. Her religious poems read like late Victorian or early Edwardian poetry, a style that has been unfashionable, rather like reading Rebecca of Sunnybrook Farm. You can appreciate the story, but the struggle with the archaic style reduces its modern effectiveness. On the whole, I would not recommend Barselow’s work to serious students of poetry. However, if you enjoy Edgar Guest, Julia Ward Howe, or Walter Savage Landor, then you would appreciate Barselow’s work as well.